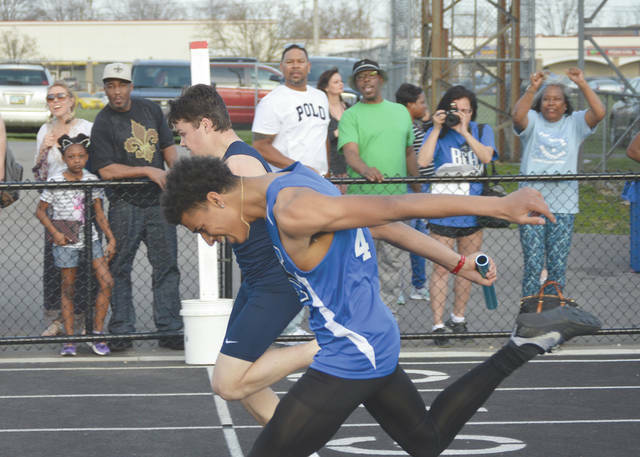 The anchor leg runners for the Xenia and Fairborn boys 800-meter relay teams finished in a photo finish in the first heat, April 13 at the inaugural Doug Adams High School Invitational track and field meet in Xenia. Fairborn (far lane) finished second overall .01 of a second ahead of third-place Xenia. A lapped Miami Trace runner looks on as Troy girls 3,200 relay anchor runner Megan Myers wins the first event in the inaugural Doug Adams High School Invitational track and field meet, April 13 in Xenia. 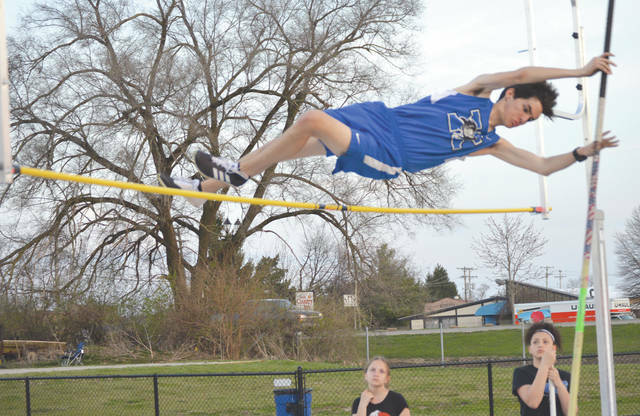 Xenia pole vaulter Matt Griesmeyer clears the bar during the early rounds of competition at the inaugural Doug Adams High School Invitational track and field meet, held April 12 on Xenia High School’s brand-new track and field facility. 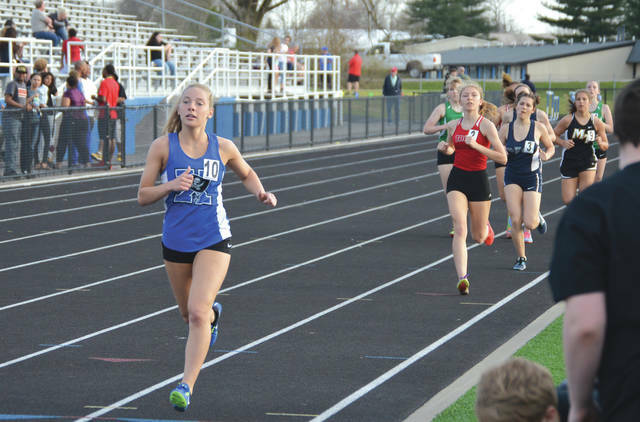 Xenia’s Grace Randall leads the opening lap of the girls 1,600-meter run, April 12 during the Doug Adams High School Invitational track and field meet, in Xenia. XENIA — Smiles could be found nearly everywhere as the inaugural Doug Adams High School Invitational track and field meet christened the brand-new Xenia High track and field facility under sunny skies. Host Xenia placed sixth in the final girls team standings, and eighth in the boys team standings. Local foe Fairborn was ninth in the 12-team girls standings and seventh among the 11-team boys standings. Trotwood-Madison won the boys title with 141.5 points, followed by Fairmont (96.5), Northmont (95.5), Springfield (94), Troy (67.5), Miami Trace (47), Greenon (42), Xenia (34.5), Fairborn (30.5), Northmont B (6), Troy B (4.5) and Xenia B (0.5). Troy was the victor in the girls standings with 185 points, followed by Trotwood-Madison (92), Fairmont (91), Northmont (90), Miami Trace (50), Xenia (46), Fairborn (42), Springfield (40), Greenon (34), Troy B (16) and Xenia B (6). 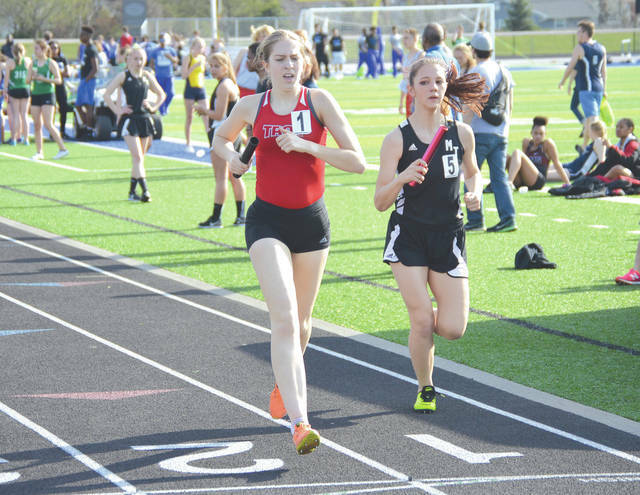 For the record, the Troy girls 3,200-meter relay team of juniors Olivia Tyre and Kate Pence, freshman Dinah Gigandet and senior anchor Megan Myers won the first-ever Doug Adams High School Invitational event in a time of 10:45.6. “We didn’t know we were in the first meet,” said one Trojan runner. “It’s an honor for us to be the first winner and to bring it home for Troy,” said another. Xenia’s girls 400 relay team of DeLenn Greene, Olivia Johnson, Shali Morris and Wright (first names for relay members were not provided by the finishtiming.com results, nor listed on the event heat sheet) placed second with a time of 53.58 seconds, and freshman Reaghan Wakefield placed second in the high jump (4 feet, 10 inches) to lead the Xenia girls team. The Buccaneer boys’ Husain Akinyele finished in a tie for second in the boys high jump with a leap of 5 feet, 10 inches for the best Xenia boys finish. The boys 400-, 800- and 1,600-relay teams each placed third. Xenia coach Matt Bartley said it had been 11 years since Xenia had hosted a track and field meet. Hosting a meet on its own state-of-the-art track and field facility meant a lot to the student athletes. “Since 2007, we’ve been on the road for every meet. You never get to have your friends stop in, or the community drop by, to see you run. We take a lot of pride in this, and they’re really excited about having a home track meet tonight, and then we’ll look forward to hosting the Greene County Invitational next Thursday,” Bartley said. The Fairborn boys 800 relay team placed second for the Skyhawks’ top finish. On the girls side, Brittany Hogan finished third overall in the 100-meter dash in a time of 13.04 seconds. Tysonna Jones placed third in the 400 dash in 1:05.95. Girls coach John Barr was encouraged by his team’s performance, especially since the teams haven’t had much chance to compete or practice. Fairborn and Xenia will be joined by every other Greene County high school with a track and field team as Xenia’s brand-new Doug Adams Stadium track and field facility will play host to the annual Greene County Invitational meet, scheduled to be held on Thursday, April 19.